Harvest is here and Winter is just around the corner. It had been a while since I looked into how the Oregon oil farms were doing. The trees have had a chance to root and grow all summer. But winter is coming and winter has not been nice to Oregon olive oil in recent years. To find out how things are looking, I visited Red Ridge Farms in Dayton. Drive an hour out of the city, and you can find Red Ridge Farms owned by the Durant family. On a hill top, surrounded by Oregon wine country, step out of your car it almost feels like you've been transported to another place. Manicured gravel pathways. Herb gardens and green houses. Fountains and teak patio sets from which you can survey olive orchards, clusters of birch, oak, and distant golden rows of autumn pinot vines under the pale autumn sky. Although the Durants have been Oregon wine pioneers since the early 70's, now it is the olive trees that are the hot topic. Because of the cooler climate, most olive growers in Oregon are planting super high density Arbequina trees. 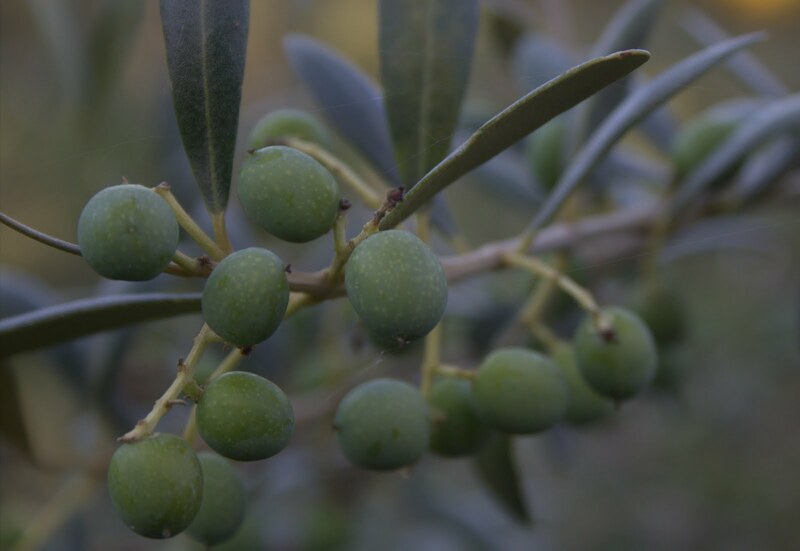 Although most olive trees thrive in warmer weather, this variety can withstand temperatures down into the 20s. But even that may not be enough. For the past two years Oregon winters have had cold snaps down into the single digits, and this has devastated the industry. "We lost about 60-65% of the Arbequina last year," says Paul Durant. And that was not the worst of it. The Durants also planted a acres of Arbosana and Koroneiki. Not quite as cold tolerant as the Arbequina, both of those crops took almost 100% losses. The impact was great enough that the Durants have decided to move on from Arbosana. The few bottles left in the gift shop from last year's harvest are all that is left. The Koroneiki is another story. After milling what little crop they harvest and combining with olives bought in California, the results were outstanding. "We're thrilled with the Koroneiki this year," says Paul. And I have to agree. Koroneiki is a darker green Greek variety with a smooth and buttery richness that is outstanding on bread with a little salt. Fresh Oil and A Fresh Start? 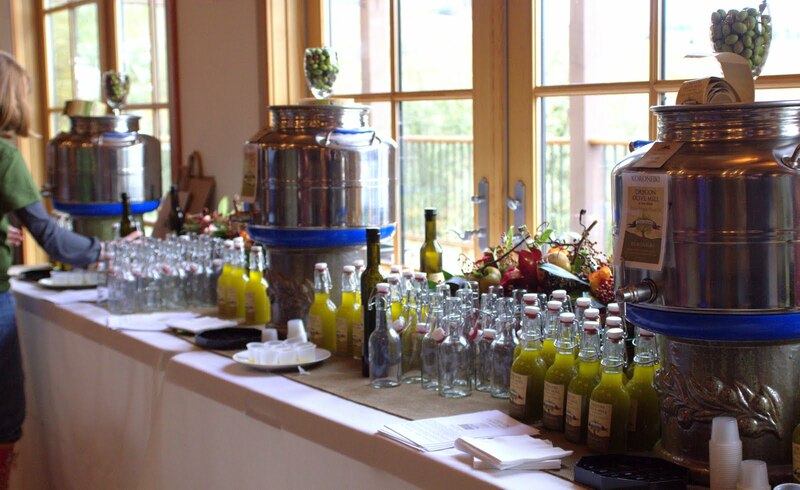 At the Olio Nuovo Festa this weekend, the excitement about the new oils was clear. The parking lot was full and the tasting room was bustling. There was wine tasting of the Durant Vineyards Pinot Noir and Pinot Gris. 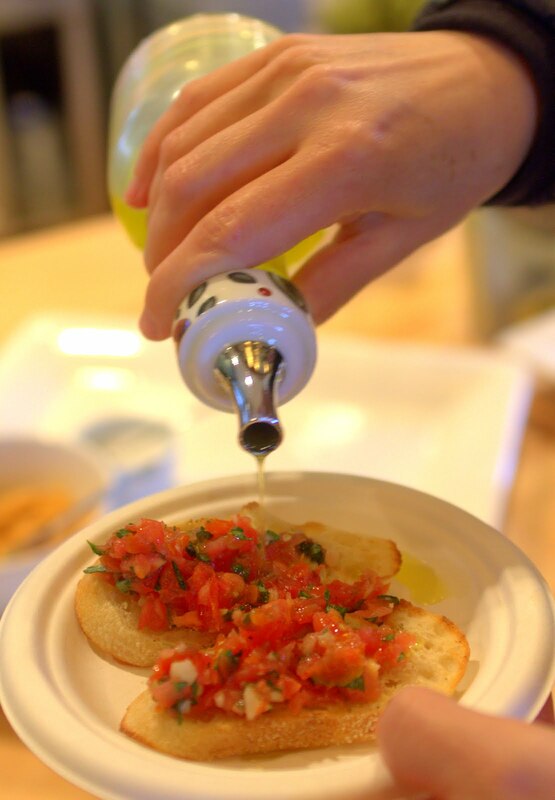 Caterers set out bruschetta and crushed garlic with, of course, olive oil to drizzle over the top. But the focus was the tasting tables featuring the three types of oil Red Ridge is producing this year--Arbequina, Koroneiki, and a Tuscan blend of three northern Italian olives which the Durants are experimenting with to replace the Arbosana. Fresh olive oil tastes really different than aged olive oil. It is cloudy with fruit particulates that have not had time to settle. In fact, all the oils had been pressed just a few days before the Festa started. Having so much fruit still suspended in the oil gives the oil a heavier texture. Low quality fresh oil tastes pungent, bitter, and burns your throat. Good fresh oil catches you off guard with its penetrating flavor of herbs and black pepper. Here again the Koroneiki was the favorite. It's because of its amazing flavor that the Durants replanted their Koroneiki orchard this year, even though it took devastating losses last year. "We just like it that much," says Paul. Hopefully the excitement and good wishes of this year's Olio Nuovo Festa can hold back the harsh winter weather. A third deep freeze in a row could be a catastrophe for Red Ridge Farm and the handful of other Oregon olive oil pioneers. 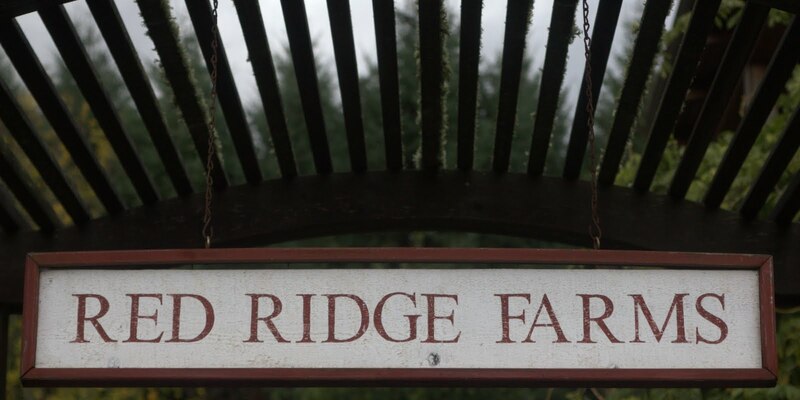 Like Red Ridge, all the other Oregon farms, such as Belle Ragazze, have been taking a heavy beating. For a fledgling industry it is a lot to bear. But as more people and restaurants realize how good Oregon olive oil is, the risks may all be worth while. It wasn't easy, but we managed to get through 7 whole days of eating nothing but locally sourced food. For all of us, it was a fun family challenge that we all worked on together. My wife was happy that we ate everything we bought. We had very little food waste. We even ate the bread, although it was frustrating and coming out too dense. My daughter thought the bread was better this way, and when toasted with a little butter, I think so too. All of us recognized that our meals were more colorful than they typically are. They were fresher. They had less sweeteners and no refined sugar at all. In fact, the only sweetener we used all week was honey. This could get a little repetitive, but also it was healthier. It was a learning experience. Kim and I went out to some of the farms and were able to have more meaningful conversations with the vendors at the market because of it. Learning about where your food actually comes from was interesting for all of us, even Hazel got into it. Would you like a side of eggs with that...and that...and that? Sunday Breakfast--scrambled eggs with onions, Anaheim chilies and heirloom tomatoes on handmade tortillas. Eggs became a central part of our daily diet. So much so that we ate a total of 3 dozen eggs in 7 days (combined from Noris dairy and Sweet Briar Farms). Their versatility made them really important. Eggs scramble with vegetables for breakfast or poached on toast. Hard boiled eggs are super portable and great for lunches on the go. Eggs in egg noodle pasta. How did we use so many eggs...I don't even remember. But by the end of the week, it was 36 eggs eaten. We had anticipated that we would be relying on eggs more than normal, but none of us expected just how much. How about some mushrooms with that...and that...and that? This was more about finding a great deal than anything else. Springwater farms was selling 6 lbs boxes of chantrelles for $25 at the farmer's market. Consequently, we had mushrooms with almost everything. The nice thing about mushrooms is how versatile they are and how mildly flavored. They go with meats, eggs, and vegetables. They can be a side dish or sauced or the featured flavor. Having something that could add a flavor layer when needed (especially since we had no spices) was really helpful. School Lunch: Better than ever! Building blocks for a new school lunch. The verdict? She liked it better that the original! Especially the bread. School lunch turned out to be easier than we thought. There were a few things that were really great. Mint Tea from Seely Family Farm. With no coffee, we were hoping to find some kind of warm morning drink when we ran into Seely family farm at the PSU farmer's market. Mike and Candy were running their booth. They are the nicest people you could meet and make some of the best mint tea I've ever had. Their peppermint-spearmint blend got us through the week splendidly. They don't have a website, so if you want to find out more about their tea, call 503-728-4603. 5 Grain Cereal from Gee Creek Farm (aka Gruel). Although they mill several different kinds of hot cereals, we bought the 5 Grain Flourless mix for the week. It comes in a 2 lbs bag for $4. This oat, rye, brown rice, barley, and flax mix turned out to be one of our favorite things to eat. I made a trip to the PSU market this past weekend just to get another bag. Scottish Wheat Flour from Eat Oregon First. We used this flour to make pasta and were really happy with the results. The texture stayed firm giving the noodles a good bite. I had low expectations because non-durum pasta usually comes out pretty soft, but this wheat was not. I should have known it would be good when Scot, the owner, told me Pastaworks also buys his flour for their noodles. Overall, the week was a bit of a shock. Being constantly faced with very limited food choices was easily the hardest part of all. Going cold-turkey on any kind of modernized food was a bigger shift than we thought it would be. No coffee. No chocolate. No bananas. No pizza. No ketchup or mustard (it is possible to make this yourself from local ingredients, more about that later). No black pepper or imported spices of any kind. No prepared foods. No eating out. No convenience. Everywhere you go there are restaurants and easy food--all of which we just had to ignore. By the time Wednesday rolled around, we were gritting our teeth and forcing ourselves not to order pizza for dinner (which we didn't). Take for instance, the bread. Even though I though we had figured out how to make bread, it turned out very dense and generally not so great. But we had to eat it. It was all the bread we had. There was no throwing it out and picking up a new loaf at the store while we worked out the kinks in the recipe. Another example--I had a work meeting where the client wanted to take me out to lunch. We went to a deli and they order the most amazing cheese steak sandwiches. Oh my god they smelled good. I sat and watched knowing I had a sack lunch of carrot sticks, apple slices, and hard boiled egg in the car. It was a killer. Local week was expensive. It was shocking how expensive it was. I understand why this kind of food is more expensive and what that cost represents, but it was still surprising just how much more expensive it turned out to be. Truly local food is treated like gourmet food and given gourmet prices. When you drop almost $200 at the farmer's market in one day for groceries for three people, it makes you think twice. Granted some of those costs were recouped throughout the week because we had to eat home all the time. There are some remedies for this, but that is a matter for another post. Perhaps the thing that all of us recognized this past week was how eating 100% local brought us all together around the shared experience of food even more. We normally eat dinner together as much as possible, but this time it was different. All of us were interested in what dinner was going to be. We could talk about making it, because almost everything we ate was made by us from scratch, even the hazelnut butter. We could talk about where it came from. We could point out what we liked about it, complain about the lack of pepper and spices, and laugh about how many times we'd eaten the same ingredient over and over. Kim said it was almost ceremonial the way we all came together around the food we were eating and preparing. It gave every meal an extra, deeper dimension that we could all take part in, together. That was the best part of the whole week. Here is a quick summary of what we ate for the week. I'm leaving out the flowery descriptions because we got a whole week to cover. You'll see there are some themes. You could call it repetitive, but really it's the local, seasonal reality. With more planning and preparation it would be possible to branch out more, but this is what we ate. Breakfast: 5 grain cereal with milk and honey. Breakfast: scrambled eggs with anaheim chiles, heirloom tomatoes and homemade tortillas. Lunch: Apples with hazelnut butter and cheese quesadilla. Dinner: Chantrelle soup with 5 grain bread. Dinner: Clams in white wine and butter. Bread. Chantrelle soup. Lunch: hard boiled egg. carrot sticks. bread. Dinner: Roasted Eliza Chicken. Roasted root vegetables. Steamed Purple Califlower and broccoli, bread. Dinner: Sweet Briar Farms Pork chops with creamed mushrooms. Sauted broccoli and brussel sprouts. Dinner: Lamb Chops with chantrelles. Roasted root vegetables. Mashed potatoes. There were two items that we did not 100% local source--cheese and olive oil. We bought 2 kinds of cheese--an aged cheddar from Willamette Valley and a soft farm house style cheese from Fraga farms. Both are local companies that produce their own product using their own milk from animals they raise, but they also use salt and enzymes in the processing that are not local. We also used olive oil from Red Ridge Farms. This oil is primarily from olives grown in California and crushed at their mill outside McMinnville, Oregon. They do grow and crush their own olives, but the volume is still very low and constitutes just a small percentage of the actual oil. 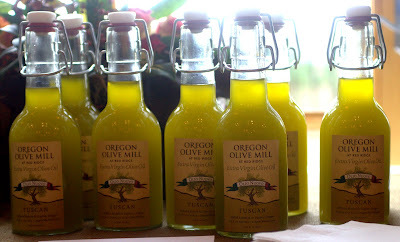 I included this because of my desire to support the fledgling olive oil industry in Oregon. 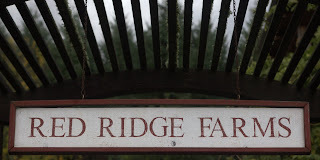 More about Red Ridge Farms in an upcoming post. Otherwise, everything else we ate or drank for the entire week was as locally sourced as we could get it. The grains came from a little further away than the other stuff. Even though we drooled our way past restaurants and longed for orange juice with breakfast, we would do it again. With more planning and preparation, the 100% local diet could actually be workable. Might be a great project for the spring. Today is the first day. We woke up to a new day, the start of a week of eating only local foods and local ingredients. We woke up and realized we had nothing for breakfast--no eggs, no coffee and muffins, no tea, no bread, no bacon, no oatmeal, no pancakes. Why was this a good idea? We are trying to go seven days eating only 100% locally sourced foods. This does not mean locally produced foods, like artisan breads. It means only foods that are grown here or are made from ingredients that are grown here. Local can be a subjective word. Does it mean within 20 mile radius? Within an hour's drive? Within the Willamette Valley? Within Oregon? For us, it mostly means foods that are grown withing about an hour's drive. Most of what we're getting is from the farmer's market and most of those farms are within an hour or 90 minutes drive. There are some things that come from farther away. Grains grow best east of the Cascades, so our bread and pasta will be regional (Oregon and Washington) but the yeast for the bread is from our own house. We are doing this because we want to know what it really means to eat truly local. It is easy to say "eat local". What most people seem to mean by that is choose something that looks great at the farmer's market, then they go home and surround it with all kinds of things from everywhere around the world. Having a local star with a foreign cast can hardly be considered a truly local production. If the local food movement is going to be anything more than a curiosity, it has to be able to provide all the pieces of the pie. If the desire really is to move form industrial agri-business to small batch, local food culture, then that local food culture has to be able to meet the omnivorous needs of the people involved. It is understood that this will require some bending on the part of the consumers involved, but how much bending? And in what ways? We live surrounded by grocery stores and restaurants and food carts that literally offer a world of edible delights. Is there really any way that a strictly local, non-industrial, small batch food ideology can realistically compete with that? When faced with such outlandish and comprehensive competition, can the ideas of the local food movement be anything more than a whim? We're taking seven days out of our lives to find out for ourselves. SWOT (Strength Weakness Opportunity Threat) analysis is a device that is used by many types of business organizations to think through new projects. It's a very useful tool that is intended to help the group consider things from several different angles. We compulsively eat out. We have food A.D.D. Learning what eating local really takes, what the trade-offs are, and how/if it can be done. 100% local food options are impossible to find on the menu of any restaurant, even the ones that bill themselves as local and seasonal. 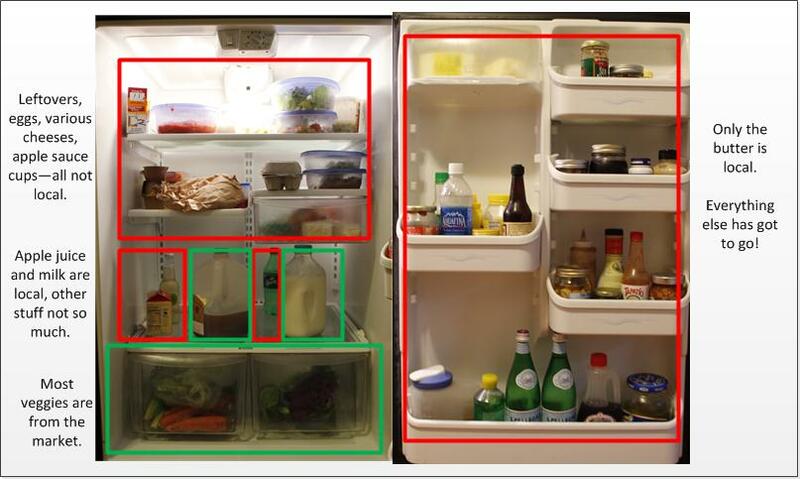 Here is a look in our refrigerator. I took this yesterday just to get a glimpse of all the things that we will not be using. Basically, we have to restock our food for the week. We don't really have a set menu for the week. But we do have some ideas about what we'd like to eat and when we'll eat them. Breakfasts will mainly be eggs, toast, hot cereal, bacon, tea, milk, honey, yogurt (maybe). Dinners will be mostly meat, veggies, soups, salads. Maybe pasta one night if we have time. Left-overs will be important. Doing meals that will last 2 nights will be important. Pot roast one night turns into lamb ravioli the next night. Fritattas are quick on weeknights. Custards for desert make sense. Lunches are the hardest, especially when packing for an elementary school student. Sandwiches go far here, hazel nut butter, jelly, fruits, hard boiled eggs, cheese, veggies, honey sticks. For drinks we're pretty much limited to water, milk, apple cider, and wine. Using all those components, I think we can swing a week of local only food. We'll see. Tonight will be braised boneless shoulder of lamb with roasted root vegetables. I'll save the broth and use it for wild mushroom soup tomorrow. This post is about A Little Hope Farm in Sandy, Oregon. I'm writing about this farm because we are getting our turkey for Thanksgiving from them. We've also bought chickens from them in the past. A Little Hope Farm is owned by Eliza Cannaday and Jeff Hlavac. It's on five acres in Sandy, Oregon. Eliza and Jeff live there and do all the work. They have many animals, but raise Cornish Cross chickens and Bourbon Red turkeys for sale, one small flock at a time. The Chickens, the Turkeys, and...the Donkey? Cornish Cross chickens are not a heritage breed. I asked Eliza about this. They'd tried heritage chickens in the past, but it didn't really work out. Americans have a clear idea of what chicken meat should taste like, and that is not how the heritage chickens tasted. "I don't think the American palette is ready for heritage chicken," she told me. Although Cornish Cross are the most common meat breed of chicken you can buy, the chickens at A Little Hope are strictly pasture raised. Never crammed into tight little cages--they sleep under the stars, walk around in the rain, eat all the fat earth worms they can find, and live their short 8 week life in about the most ethical conditions you could ever hope for a chicken to have. The turkeys have it just as good, if not better. Bourbon Reds are a true heritage breed, and it shows. They are about as close to a wild turkey as you can get in domestication. The Broad-Breasted Whites you buy in the frozen meat case at the super market are descendants of this breed. Bourbon Reds have not been altered to grow fast or get super-sized breast meat. It takes about 7.5 months to raise a flock for slaughter. Compare that to the 12 weeks it takes a normal supermarket bird and you can see that this is no get rich quick scheme. Seven and a half months means these birds have been outside for most of the year. They arrived with the spring rains, ate worms and grubs all summer long, took dirt baths on hot days in August, and are now fattening up for the coming winter. They fly out of their pen to roost on top of the chick coop in the evening. They get chased back into their pen by Eliza in the morning. Good times for turkeys. This tom gets all the ladies to himself. One other important feature of the Bourbon Red turkeys is that they can naturally breed. Because they aren't genetic mutants, they can still get to makin' babies when the mood is right. Ohhh-yeahhhh. There are so many good things about the farm that you should know, but one of the most important is the ethics they bring to farming. It isn't just about humane treatment of the birds they are raising; it's also about humane treatment of the people in their lives. "If you are lucky enough to have five acres, you have an opportunity and an obligation to grow for your community." Five acres is enough, says Eliza, that you can have a small farm with some diversity and enough room for the chickens and the turkeys and goats and donkey and human kids to roam around. Eliza and Jeff are strong believers in the benefits of diversified small farms over large mono-cultures. Not only because small batch farming normally results in less sick animals, but also because it leads to more accountability. Eliza getting some turkey eggs. Yummy. "Buy your meat from who fed it," Eliza says. This is key to breaking the industrial system. Even organic farming--if it is embedded in an industrial system--does not increase accountability between the consumer and the producer. It is the industrialized systems themselves that create separation. This includes large scale operations like Oregon Country Beef where you can have no idea who raised the meat you are eating. You're required to put your trust in the system and not the people. This can create loop-holes and gaps that perpetuate the disconnect and reduce the sense of accountability. It is this sense of accountability--to the animals they raise, their community of neighbors, friends, and customers, the natural world they are a part of--that motivates Eliza and Jeff. If you know the person you are buying from, if you see where they raised the animals and what it means to them to have a healthy product, then you are changing the way things are done, even just a little bit. That is the little hope that this farm is built on. To find out more about heritage turkeys or pastured chickens, call Eliza at 503-997-8308. Normally every bird is sold well in advance, so place your orders early.